Get dual protection with the MAPEI® Mapeguard™ 2 crack isolation and sound reduction membrane. This peel-and-stick membrane is flexible, thin, lightweight (only 40 mil), load-bearing, and fabric-reinforced. Mapeguard™ 2 helps prevent existing or future in-plane floor cracks (with movement up to 3/8" from transmitting through grout, ceramic tile or natural stone. When installed under ceramic tile, stone or wood flooring the MAPEI® Mapeguard™ 2 also helps reduce transmission impact sound like footstep and airborne sounds like voices or television through the flooring. And there is no waiting! Once Mapeguard™ 2 is applied, ceramic tile or stone can be immediately installed with any polymer-modified cement-based mortar. Glue-down wood flooring can be installed with any MAPEI urethane adhesive. 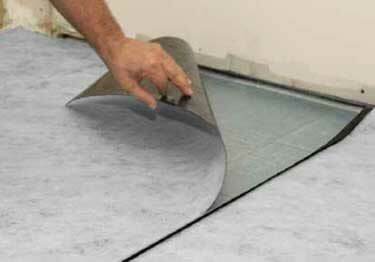 Great for residential and commercial interior or exterior (with proper drainage) floors. Ideal for use in multi-family or multi-story buildings to reduce noise transmission. Prime, peel, stick and install tile or wood - no waiting! Do not use over cracks or control joints subject to any out-of-plane movement; or in-plane movement greater than 3/8"
Do not use over substrates containing asbestos, plank wood flooring, presswood, particleboard, chipboard, oriented strand board, pressure or oil treated plywood, Lauan plywood, Masonite, self-stick tile, laminate, metal or fiberglass surfaces, or poured epoxy floors or similar dimensionally unstable materials. Get dual protection with the MAPEI® Mapeguard™ 2 crack isolation and sound reduction membrane. This peel-and-stick membrane is flexible, thin, lightweight (only 40 mil), load-bearing, and fabric-reinforced.